The Prime Minister, Shri Narendra Modi has condoled the loss of lives due to bus accident in East Godavari district, Andhra Pradesh. "Loss of lives due to a bus accident in East Godavari district, AP is saddening and unfortunate. My deepest condolences", the Prime Minister said. The Prime Minister, Shri Narendra Modi has condoled the bus accident in Tonk, Rajasthan. 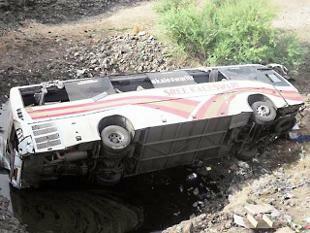 "The bus incident at Tonk, Rajasthan is very heart-rending. My thoughts are with the families of those who lost their lives", the Prime Minister said. Prime Minister, Shri Narendra Modi, has condoled the demise of Shri Nek Chand, the creator of Chandigarh's rock garden. "Nek Chand ji will always be remembered for his artistic genius and fabulous creation that is cherished by many. May his soul rest in peace," the Prime Minister said. The newly constructed Academic and Hostel Blocks at Central Institute of Plastics Engineering & Technology (CIPET), Imphal were jointly inaugurated by Union Minister of Chemicals & Fertilizers Shri Ananth Kumar and Chief Minister of Manipur Shri Okram Ibobi Singh at a function in Imphal, Manipur today. In his address, Minister of Chemicals & Fertilizers Shri Ananth Kumar informed that CIPET, Imphal will be further expanded at a cost of Rs.13.00 crores which includes creation of additional hostel facility (Rs. 9.00 crores) and enhancing the technical infrastructure facility (Rs.4.00 crore). He requested the State Govt. to provide 5.00 acres of additional land to CIPET, Imphal to initiate expansion of the centre. He further added that such expansion will result in doubling the present intake capacity of students at CIPET, Imphal. Chief Minister of Manipur in his address appreciated the services rendered by CIPET, Imphal in promoting the plastics industries in the State of Manipur as well as enriching the living standards of unemployed youth through gainful employment. Minister for Chemicals & Fertilizers assured the State Government to extend support from Govt. of India for initiation of Plastics Park and requested the State Government to provide 500 acres of land. Chief Minister of Manipur assured to provide all the support for expansion of CIPET, Imphal and establishment of Plastics Park in Manipur. CIPET is an ISO 9001:2008 QMS, NABL, ISO/IEC 17020 accredited premier national Institution under the Dept. of Chemicals & Petrochemicals, Ministry of Chemicals & Fertilizers, Govt. of India devoted to Academic, Technology Support & Research (ATR) activities for the growth of Polymer & allied industries in the country. CIPET operates on hub & spokes model with 23 locations spread across the country having uniform state-of-the-art infrastructural facilities. CIPET Centre at Imphal was established during 1987-88 to cater to the needs of plastics and allied industries in the State of Manipur in particular and North Eastern Region in general. CIPET, Imphal has been significantly contributing in encouraging and assisting the local entrepreneurs in Manipur, Mizoram and Nagaland through organising training programmes in different disciplines of Plastics Engineering & Technology. The centre has been equipped with the state-of-the-art equipments and machineries, which include conventional as well as Micro processor controlled processing & tool room machinery for manufacturing different types of products. New long term Diploma programmes and short term vocational skill development programmes will be initiated at CIPET Imphal with help of this additional infrastructure to generate employment opportunities for the unemployed/underemployed youth in the State of Manipur in particular and NE region in general. Commissioning of the Assam Gas Cracker Project (AGCP) at Dibrugarh, Assam shortly with an investment of Rs.9000 crores and consequent development of downstream plastic and its allied industries in the region will further enhance the self-employment and employment potential. Shri Govindas Konthoujam, Minister of Commerce & Industries, Govt. of Manipur; Dr. Thokchom Meinya, Member of Parliament (Lok Sabha) participated in the function. Shri Surjit K.Chaudhary, Secretary, Department of Chemicals & Petrochemicals, Govt. of India; Shri P.C.Lawnkunga, Chief Secretary, Govt. of Manipur were also present. Shri Pradeep Kumar Sinha, an IAS officer of 1977 batch, UP cadre, today assumed charge as Cabinet Secretary. He takes over from Shri Ajit Kumar Seth. Shri P.K. Sinha was earlier OSD in the Cabinet Secretariat. He has served in different capacities in the Government of India as well as in the States.